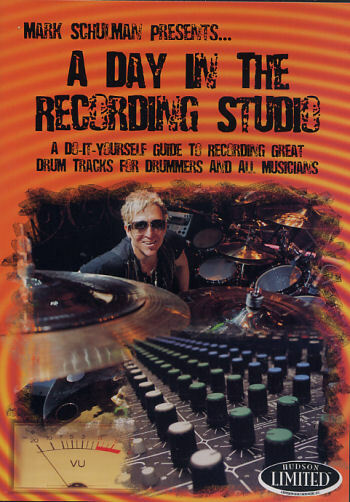 Tiger Bill Reviews A Day in the Recording Studio DVD by Mark Schulman from Hudson Music. The days of recording in an expensive studio with an engineer are virtually gone. With an outlay of a just a few thousand dollars, anyone with the know-how can produce a recording as good as any million dollar production studio. Mark Schulman was always interested in recording as well as playing drums and, with this DVD, he introduces us to the recording concepts of today: Do-It-Yourself. You can download the free 36-page booklet and free play along tracks from the DVD at Mark's home page. Lots of musicians today have their own recording gear setups, many in their own homes, and they make their own CDs on the cheap. If you're a drummer who has yet jump on the bandwagon, this DVD will take you all the way from covering all of the basic studio gear you'll need to tricks and tips on using the recording gear to playing with a click track, charting drum parts, optimum playing techniques for the studio, and recording the best sounding drums possible. Mark has produced a very informative DVD. Highly recommended.